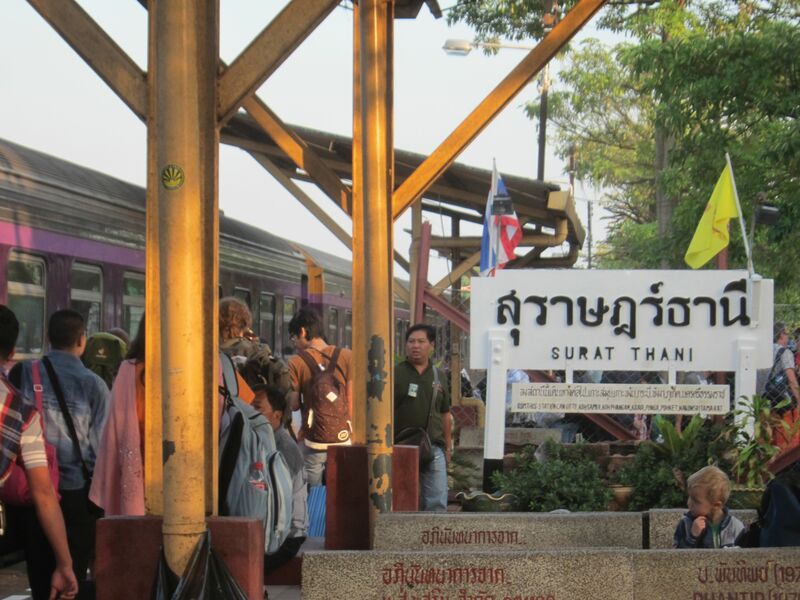 After a 40 minute spine crunching ride on the Koh Samui road, 2 ferry rides surrounded by 20-somethings who thought the sun shone out of their butts and a hour bus ride, I was spat out at the Surat Thani train station in Thailand. Mind numbed and body aching, I was disoriented from popping anti-nausea pills like smarties all day. I was paranoid the train would leave without me and I would be trapped here in Full Moon Party-land, a fate worse than death. Somehow I just couldn’t get a handle on what time it was and what time the train would leave. I obviously hadn’t gotten my land legs or mind back yet. I was hungry and had to really pee but loathe to leave the vicinity of the train so I found a funky little cafe painted pink with dance music playing on the second floor of the station. The only available washroom was the public one. One word – eeeeeeuuuuuuu! A pit with ceramic foot stands on either side. Obviously men AND women had found it challenging to hit the hole in the floor. I needed a shower after that one. Oh and I had to paid for the privilege of flirting with dysentery! Boarded the train with my lunch and finally felt secure enough to breath a sigh of relief. Happily munching on my barely edible grilled cheese sandwich the stress level dropped. I was on a train! I love trains, I really do. There is something exotic and exciting about chugging along, swaying as we meander through villages and past farms and jungles. As a solo traveller I find it much more social than buses, you can move around, go grab something to eat in the dining car and everyone isn’t facing the same way. And I am less likely to have to share the seat with whole families and their livestock since most rail-lines frown on livestock in second class. 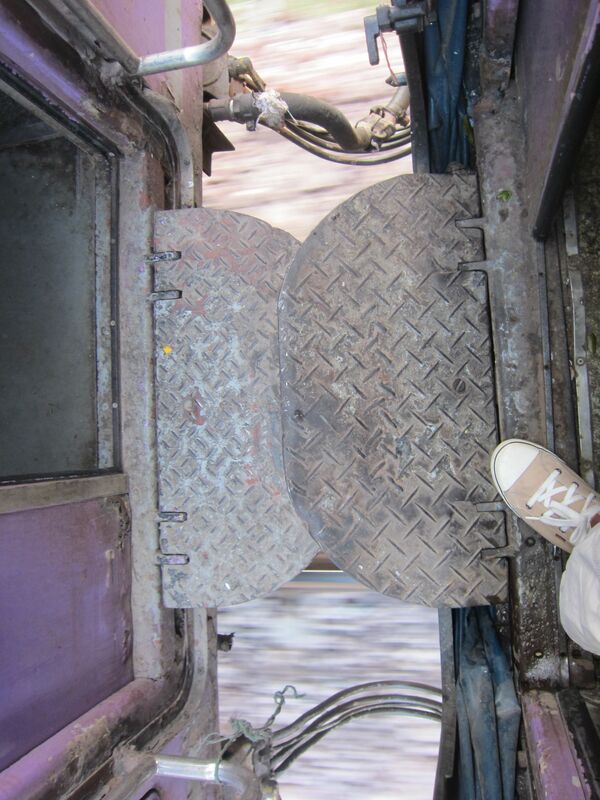 Some Thai trains have single seats facing each other, again making it easier to interact and move around. Between cars had me giggling with delight. They were open to the elements and the connecting plates were bare. The safety police at home would have brain hemorrhages if they saw that! But to me the danger just added to the sense of adventure! At eight pm the porter made up our beds (whether we wanted to or not). Hard to describe how happy I was in that bottom bunk with the aisle curtain pulled tightly closed while the window was bare so I could watch the towns slide by. People were still afoot on the ubiquitous motorbikes, bicycles and walking, all a slow blur of mystery. What were their lives like? 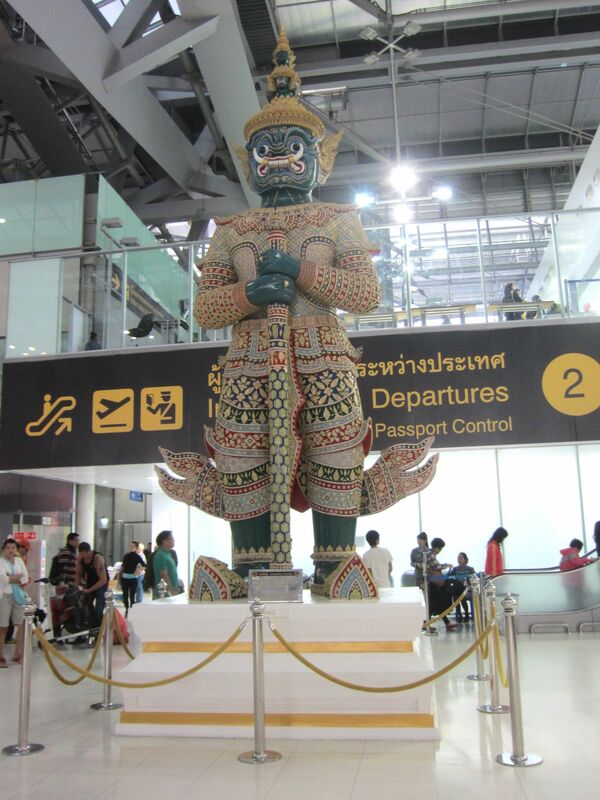 I had nothing to deal with until morning when I arrived in Bangkok, no decisions, no timetable to angst about. Life was suspended. My little cubby on the train. Breakfast was an event! Calling it a dining car is misleading. True, there is food, sort of. Greasy gross food, but technically food and people eat it there, so dining car it is. But crappy meals aside, it had a party atmosphere that transcended the instant coffee and the cold hard eggs. At the end of January, the New Year’s Eve well-worn tinsel decorations were still up, looking oddly optimistic. I threw open my window and hung out taking pictures, grinning like a fool, the blaring techno my theme music. The rising sun in my face warmed me after a chilly night curled up in my little nook. This was not a high speed train, it was more a “amble through the country side making friends” kind of train, allowing time to soak up the light filtering through the leaves giving the dusty towns an aura of beauty that would be gone by noon. That early morning experience infused me with such joy, such a “be here now” moment that I still experience residual glee-rushes writing about it. At the risk of being arrested for using the ultimate cliche, I was high on life that morning! Bangkok has no clear demarcation, there is just a steady increase of humanity… poor humanity. Poverty lives on the fringes of large cities in developing nations, literally and figuratively. Grungy buildings held together by dirt and few nails risk losing their battle with gravity. People scurrying with heads down as if lacking the strength to raise them. The lucky ones with jobs wait for buses to take them closer to the city center. The servants, the nannies, waitresses, cooks, street cleaners… all necessary so that the wealthy can do their wealthy business. The train was late. People are only surprised when a Thai train is on time. I would have to really boot it to make my flight to Hong Kong. I stood between the cars ready to make my get away. As the train slowed down the porter jumped down. 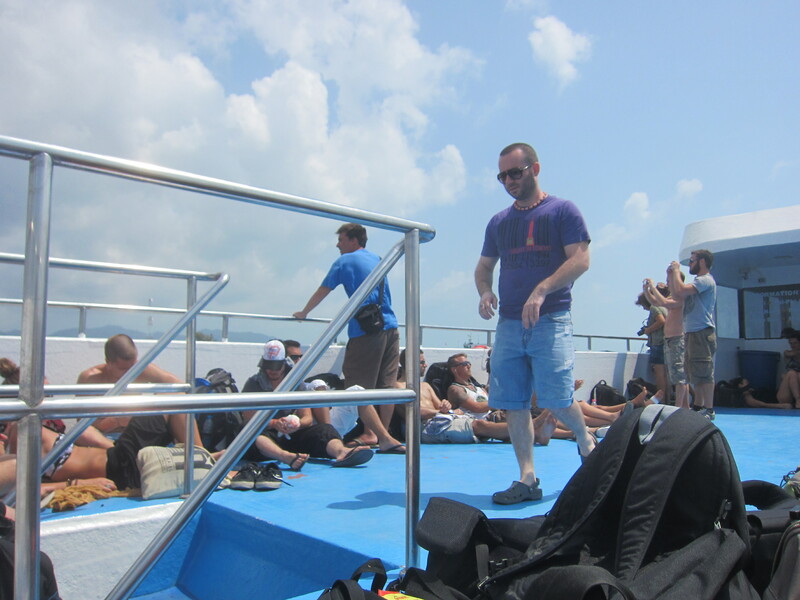 Not giving him the opportunity to say no, I tossed him my big bag and jumped! I hit the ground, luckily on my feet, grabbed my bag and boogied down the platform well ahead of the rest of the passengers. I nabbed the first taxi and he turned out to be THE BEST driver, EVER! He got me to the airport in time and was rewarded with the rest of my Thai Bhat. ← Introducing My Perfect Carry-On! Wonderful post! I can’t tell you how many years I’ve researched the sights and the flights to Thailand, somehow never getting up the courage to go alone. It sounds like you felt comfortable and had a great time, even on the night train. Oh Beth I hope you go! I never felt unsafe and I took 3 trains all together, all night trains. They lock the doors and I think there is a porter in each car. Thanks for coming by! Sounds like quite an adventure. Love the new theme to the blog too. This is one trip I always wondered about doing. Glad you survived it. I have read so much about traveling there and it’s tribulations. Just wanted to drop by and wish you and yours a happy and healthy holiday season! And a wonderful season to you and your beloveds, thank you for coming by. I did that train journey many many moons ago! I bet you have some great stories to tell! 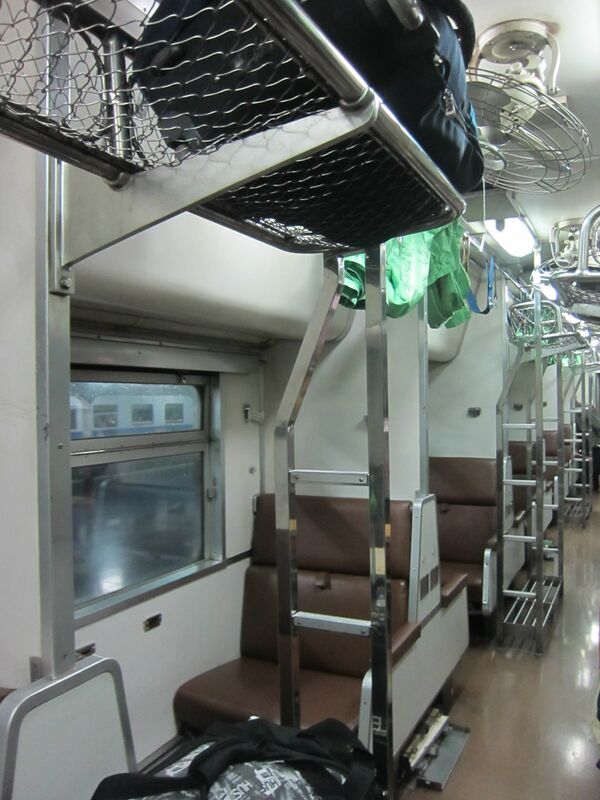 Your Thai train seems quite nicer than my Sri Lankan train (cots! a dining car! windows!) and I really loved your description of its progress (“amble through the country side making friends”) and the sad, but accurate, depiction of the slums that, inevitably, house the newcomers in the big cities. Thanks for the ride! Thank you, glad you enjoyed it. I retire in January and I’m going to travel full time for awhile and one of the things on my list is the Singapore – Bangkok train.